If you’ve read my recent blog posts, you are more in the know than most of the doctors currently are in regards to Pertussis. However, there are a few points that I want to clarify. When my daughter had a positive test, I went to my doctor. I had an appointment scheduled at that time anyway, so I decided that I needed to have myself tested and treated. I was not very sick at that time. I was just starting to get a slight cough. I had already had the cold like symptoms 12 to 14 days prior, so I was a bit surprised that I hadn’t developed the severe coughing like everyone else had. I had only started coughing the night before my appointment. I had not started researching Pertussis at that point, so I was pretty uninformed. My doctor did feel that it was necessary to be tested. He ordered a blood test because our local lab did not perform the nasopharyngeal swabs. They treated the nasopharyngeal tests as a “procedure”, and their phlebotomists were not skilled in performing “procedures”. Because of this, my GP ordered the blood testing. If you’ve read my previous posts, then you would realize that having blood testing during the first few days of developing the “whooping” cough, would not be accurate. Having a blood test during this period can lead to false negatives because your antibodies do not have the time to build in response to the infection. I also had to take my son to get tested. We took him to the Children’s Hospital urgent care department last Saturday. Now, my son by this time had his “whooping” cough for more than 4 weeks. The nurse that was in charge of his care was very reluctant in getting him tested. She did not see the need. I explained that it wasn’t for his care but so that health department could record his case. When I finally convinced them to do it, they were going to do the nasopharyngeal testing. This was the incorrect procedure. At this point I had researched it and I knew it, so I voiced my concerns and stated that he needed to have the blood test performed. I’m sure you can understand that my correcting the nurse was not met with the best attitude. Actually, she did not come back, but they did both the nasopharyngeal and blood testing, and I was satisfied. I got the call back today. My son’s nasopharyngeal test was negative (which is what I was expecting because it was beyond the time frame for that test to work), but his lab work showed he had recently had the infection. So, I was right. If I hadn’t stood my ground, he wouldn’t have had the confirmation that he had it. The hospital has now contacted the community health department and his high school, which was the whole point of having him tested. You need to know about Pertussis. You need to know about testing, treatment, symptoms, etc because your doctor may or may not know about it. They make mistakes, and because Pertussis is rare and is making a comeback, in order to get the best care you and your family deserves, you might need to stand your ground against them. It’s hard to do even when you know you are correct, so you have to be absolute and persistent. The most important reason for getting a test is to proactively prevent it from spreading. It can kill babies and toddlers, and right now there is a country wide misbelief that if you have your vaccinations that you won’t get it. Culture is best done from nasopharyngeal (NP) specimens collected during the first 2 weeks of cough when viable bacteria are still present in the nasopharynx. After the first 2 weeks, sensitivity is decreased and the risk of false-negatives increases rapidly. PCR should be tested from nasopharyngeal specimens taken at 0-3 weeks following cough onset, but may provide accurate results for up to 4 weeks of cough in infants or unvaccinated persons. After the fourth week of cough, the amount of bacterial DNA rapidly diminishes, which increases the risk of obtaining falsely-negative results. 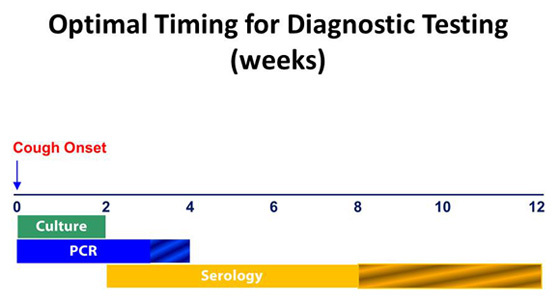 For the CDC single point serology, the optimal timing for specimen collection is 2 to 8 weeks following cough onset, when the antibody titters are at their highest; however, serology may be performed on specimens collected up to 12 weeks following cough onset. The other very important topic I wanted to discuss, is antibiotic resistant Pertussis. Ok, Pertussis in and of itself isn’t a significant health issue compared to other communicable diseases, but the number of reports of people who have pertussis has been increasing every year. Again, this is for several factors mentioned in my previous posts. That said, there are also numerous reports of antibiotic resistant pertussis strains. The general treatment for pertussis is the erythromycin family of drugs. However, since the 1940’s there have been cases of antibiotic resistant forms of pertussis. There have been additional cases reported from Arizona, California, Utah and Wyoming in the past 4 years. This year, there was a report in France. In these cases, those treated with the erythromycin family of drugs did not recover as expected from pertussis. It seems that in these cases, the person continued to get worse even after receiving treatment. Now, as I reported previously, antibiotics do not stop the symptoms (generally) unless the treatment is started in the first few weeks of infection (before the cough begins or shortly after it begins). The symptoms from Pertussis are caused by the toxins that are caused from the infection as well as the immune response our body has to the toxins. The reason a person is prescribed antibiotics is to kill the bacteria so that it does not continue to spread. So, I do not fully understand why having an antibiotic resistant form is significant. Unless, it is more contagious than its non mutated form. It also seems that with the antibiotic resistant form, the infection lasts longer and is more symptomatic. After further review of the above articles and others, I found that the importance of antibiotic resistant pertussis is that a person generally experiences an improvement with initial antibiotic treatment, but after a week or more, there is a sudden worsening of symptoms. This seems to be the alarm that indicates a person has an antibiotic resistant form of Pertussis. I also find that it is important for medical evaluation and treatment if your symptoms do become worse. This is because Pertussis can cause pneumonia and other secondary infections to occur. So, if you are feeling better, but then start to run a fever or have trouble breathing, etc it is important to be re-evaluated. I do not know with certainty if antibiotic resistant pertussis is contagious beyond the five days of antibiotic treatment. I would assume that it is. However, you would want to contact a specialist (I would suggest speaking with an infectious disease specialist). I will try to update posts as I can with the most up to date information. So, I think this is some of the basic information that you should know regarding Pertussis. 2.) 2012 is on course to have the most recorded (verified cases) since 1959. There is an expectation that more than 40,000 cases will be verified nation wide. So, far approximately 29,000 cases were reported to the CDC as of September 20, 2012. Please see the previous posts as to the possible reasons why.3.) This figure does not include the number of cases that go misdiagnosed or un-diagnosed. It is estimated that there are 2- 3 cases unreported for every case that is. 4.) Children under the age of 1 have the highest risk of death and serious complications. They usually have to be hospitalized. Their symptoms tend to be apnea. They may not have any indications that they are sick at all, except they tend to gasp for breath. They usually do not have the gasping or whooping cough that is present in children and adults. Stage 1: Symptoms mimic the common cold and is contagious via sneezing. (In our case, we had nasal congestion, headache, fatigue, and all over body aches.) It generally lasts 7 to 10 days but can last from 4 to 21 days. Stage 2: Severe coughing that can lead to vomiting (may or may not develop a “whooping” sound with the coughing). Generally, the coughing will go in “spells” and then resolve. These coughing fits will be worse at night. This stage lasts from 1-6 weeks but can last up to 10 weeks. 6.) A person can develop the severe coughing spells with subsequent upper respiratory infections (ie, colds) after they are over the Pertussis bacterial infection. 7.) Teenagers and Adults are at a high risk for developing pertussis, but it is generally not life threatening, unless they have a compromised immune system or are over the age of 65. 8.) The coughing is not caused by the bacteria directly but by the body’s response to toxins that the bacteria and your immune system produce. These toxins cause inflammation of the respiratory tract and paralysis of the cilia in the respiratory tract. The infection has recently been discovered in deeper tissues of the lungs as well.9.) YOU MAY NOT HAVE A FEVER or might only have a low grade fever with the infection. 10.) An antibiotic kills the bacteria and makes it non-contagious, but it does not get rid of the coughing or other symptoms once the severe coughing begins (because that’s the body’s reaction to the toxins the bacteria produced). 11.) The general incubation period (period from when you were exposed till the time you develop your first symptom) is 7-10 days (BUT IT CAN TAKE UP TO 6 WEEKS!!!!). This means that if you have lunch with a friend who is sick with pertussis during the contagious period, you may not develop the first symptoms until 6 weeks later. 13.) If you are not treated with antibiotics, you are contagious for approximately three weeks!!! After three weeks of illness, the bacteria is generally gone and your symptoms are being caused by the toxins. 14.) Once you begin taking antibiotics, you are contagious for FIVE days after you take it. 15.) Nasopharyngeal testing is most accurate within two weeks after the coughing fits develop. After that it is less accurate, and there is a higher chance of false NEGATIVES. Blood tests can be used from the 2 to 8 week point(after onset of severe coughing) but is not as accurate as the nasopharyngeal swab test. To indicate recent infections via blood testing, it is important to have your IGA antibodies tested. If those are above normal, it is because you have recently had the illness. 16.) Unlike other bacterial infections, this infection produces generous amounts of CLEAR, stringy mucous. (This is another reason that it is commonly misdiagnosed as allergies, cold, etc). It means, you have to be proactive. It’s important that if you’ve had it (especially in confirmed cases) that you let people you’ve been in close contact with (up to six weeks prior!) know that you were diagnosed. I also believe it is fundamentally important to get a confirmation of the illness. Because if your doctor just proactively treats you with an antibiotic, you may not have it, and you don’t want to panic people if you don’t. Also, you may have an antibiotic resistant form or a form different from pertussis that is causing the same symptoms, in which it is important to confirm and report any mutations so that these issues can be addressed through the CDC. The testing for pertussis is not instantaneous, so I would highly recommend that if it is suspected that you have it, quarantine yourself and those you live with until you have a definitive answer. I’ve talked with many health professionals over the past week, as well as representatives from the CDC. There isn’t any medication that can be prescribed that will remove the toxins. You body just has to clear them naturally and this is why it can take up to 6 weeks for you to recover from the cough. However, it is suggested that there are OTC remedies that might help relieve the coughing spells. I will provide both basic OTC remedies, as well as non traditional remedies that might help. None of these suggestions are proven, but when you are miserable or your children are miserable, you will find you are willing to do anything that might help. There is no scientific proof that any of those remedies both natural and basic OTC medications work at all in relieving the symptoms, killing the bacteria, or preventing the spread of whooping cough or any other illness or infection. However, you will find that when you’re child is coughing so hard that they are vomiting that you will try anything. If you do try the natural based products, in order for any relief at all, they need to be used on a consistent basis. Natural products do not have the potency that prescription medicines have, so they do not provide immediate relief. Please feel free to ask questions or leave advice for what has worked for you. We are in the midst of an outbreak of Pertussis, and there is a lot of information pointing blame at those who have not been immunized or fully immunized. At first, that was what was widely believed to be the cause. However, recently, it has become accepted that the pertussis vaccine is not as effective as an earlier version. There are a few theories as to why, but the medically accepted reason right now is the new formula that was introduced in the late 1990’s is not as effective as the original vaccine. The original vaccine contained whole cells of the bacteria. The new vaccine contains acellular components of the bacteria. They changed the formula because there were serious side effects ranging from fever and malaise to meningitis. Frankly, there have been significantly more claims of reactions to the original (whole cell) vaccine, but those are the widely accepted reasons behind changing it. The original vaccine, which contained a small amount of inactivated whole bacteria, was a crude form that brought with it side effects like fever and swelling at the injection site, but it was considered lifelong lasting at preventing the disease. In the late 1990s, it was substituted for a so-called cleaner vaccine that only used small particles of the bacteria and was considered safer but might not be as effective long term. The following article is in accordance to the belief of the vaccine not being as effective, according to an article in the Oxford Journals, Clinical Infectious Disease: (http://cid.oxfordjournals.org/content/early/2012/03/13/cid.cis287.short). We identified 171 cases of clinical pertussis; 132 in pediatric patients. There was a notable increase in cases in patients aged 8-12. The rate of testing peaked in infants, but remained relatively constant until age 12. The rate of positive tests was low for ages zero to six, and increased in preadolescents, peaking at age 12. Vaccination rates of PCR positive preadolescents were approximately equal to that of controls. Vaccine Effectiveness was 41%, 24%, 79%, for ages 2-7, 8-12, 13-18, respectively. So the question starts with, does the vaccine really work? And it is not certain if it does. If we use the data from above Oxford Journal article, the effectiveness of the vaccine in ages 2-7 was 41%, ages 8-12 only 24%, and ages 13-18 it was 79%. Frankly, I don’t think any of those statistics are promising considering the severity of the infection. The etiologic agent of pertussis, Bordetella pertussis, is extremely monomorphic and its ability to persist in the face of intensive vaccination is intriguing. Numerous studies have shown that B. pertussis populations changed after the introduction of vaccination suggesting adaptation. These adaptations did not involve the acquisition of novel genes but small genetic changes, mainly SNPs, and occurred in successive steps in a period of 40 years. The earliest adaptations resulted in antigenic divergence with vaccine strains. More recently, strains emerged with increased pertussis toxin (Ptx) production. Here I argue that the resurgence of pertussis is the compound effect of pathogen adaptation and waning immunity. An unusual 2010 outbreak of whooping cough in Ohio that disproportionately affected adolescents led disease hunters from the US Centers for Disease Control and Prevention (CDC) to the surprising discovery that about a third of the cases were caused by infection with Bordetella holmesii and not Bordetella pertussis, the usual isolate among individuals with the characteristic symptoms of whooping cough. There is another Bordetella pertussis whooping cough disease called B. parapertussis. Symptoms of B. parapertussis whooping cough can look identical to B, pertussis whooping cough but they are usually milder. B, parapertussis is increasing in the U.S. and other countries, which have had high pertussis vaccination rates for few decades. There are estimates that perhaps up to 30 percent of whooping cough disease in highly vaccinated populations may be caused by B. parapertussis organisms. It is possible to have both B. pertussis and B. parapertussis infections at the same time. Parapertussis is often milder than B. pertussis but can also involve serious complications which lead to pneumonia and death. Pertussis vaccines widely used around the world do not protect against parapertussis. There is no vaccine for parapertussis. Finally, is there an actual increase at all? Right now, there is a LOT of publicity decreeing an outbreak, and you have people taking sides of who is to blame. You have people saying that it is being caused by the vaccine itself. You have people stating it’s from vaccinations not working or that it’s because some people aren’t getting vaccinations. Some people believe that the vaccines have caused mutations in the bacteria, and others believe that the vaccinations aren’t working because of the mutations in the bacteria. The most intriguing idea that I found is a belief that there hasn’t been any increase at ALL. This final group that I’m researching believes that the number of people getting pertussis hasn’t increased, but the methods and standards for “classifying” a person as having pertussis has changed. Previously, in order to be diagnosed with pertussis, a person had to have a persistent cough for more than 3 weeks AND a positive test for pertussis in order to have a “confirmed” case of pertussis. The CDC changed their definition and now states that a person only has to have the cough for 2 weeks AND a positive test for pertussis. There have also been more defined symptoms for having pertussis. This makes it more likely for a physician who might not have considered it as being pertussis to now consider and test for it. Regardless of these changes, it is also firmly accepted that for every reported and confirmed case of pertussis there are two or three cases that still go unreported. I found this to be true in the case of my family. When the test was positive, I thought, boy they’re going to want to notify EVERYONE (my son was sick first, and he went to school the entire time), but when the community health department called, I was told that even though my daughter had the positive test, they would not consider her as to having it because she has only had the cough for 10 days. Further, they were not going to “confirm” my son as having it even though he’s had his cough for 4 weeks because he did not have the positive test. I was shocked! There weren’t going to be any notifications at all. I found this to be incredulous. The community health representative told me that if I took my son back to get tested, and he had a positive test than they would submit the confirmation, and if I called them back to report that my daughter still had her cough after 14 days, they would confirm her case too. My children exposed a significant number of people while they were unknowingly contagious, so I approached their doctor to get the lab work done, but found out that she did not feel that it was necessary. AND it is not necessary for them. They don’t need the confirmation. They are being treated, but it is going unreported and therefore no one else will get the notice. The people that they exposed will not know to watch out for the illness. I tried to address those concerns with their doctor, and she said it didn’t matter because as long as the people that they’ve had contact with have had their vaccinations, they won’t get it. I tried to express that I had found information to the contrary and even representatives from the CDC were stating that the vaccination is not as effective as it had been previously. She felt I was wrong. Frankly, it doesn’t matter to me what she thinks of me, it’s the fact that she is treating other people and if she doesn’t understand the importance of having the illness reported, then I’m at a loss. She felt that we should just contact everyone that we’ve been in contact with over the past few weeks, but it simply isn’t as simple as that. My son plays for both JV and Varsity football. He is in contact with 100’s of people each week. We went to a MAJOR amusement park for two weekends while they were sick. There is no way to contact everyone that they’ve exposed, especially without the help of the community health department. Again, she also believes that other people won’t need to worry about it because they’ve been vaccinated (I shared this belief prior to a week ago), but now I know that might not be 100% true. She wasn’t the only local doctor who feels this way. I took my children back to the local children’s hospital yesterday, and the nurse that was taking care of them didn’t understand the need for testing and agreed with my doctor. As long as they were being treated, what’s it matter? Our babysitter has been exposed over the past few weeks, and she started getting sick this week. Her father wasn’t going to do anything about it. Since she is 18 (and fully vaccinated), we took her to her doctor, and he treated her but did not run the testing to see if she had it. The doctor felt that she probably did have it, but he felt that testing or reporting of it was unnecessary. Granted, the information in this post is new. It just gained major media attention in September that there are more reported cases since the 1950’s AND that those who have been vaccinated are getting ill too, but it is mind BLOWING to think that the local medical community does not understand why testing and reporting it is necessary. That is the reason, I am writing about it now. I feel it fundamentally important that if you believe you have pertussis, than you need to get treated ASAP. You need to quarantine yourself until you’ve been on antibiotics for at least 5 days. You need to push for getting the testing done and have it reported to your local health department, and PLEASE do not think that just because you’ve been vaccinated (even fully vaccinated) that you don’t have it. Especially get tested if you find out that someone you know has been diagnosed with it and then you start to develop symptoms. Can you believe that my family has been diagnosed with Pertussis? Me neither. Frankly, folks, I have always stayed away from vaccinations. I have this belief that the reason I developed autoimmune issues was because I had a booster series of immunizations in 2000. I started gaining weight and getting sick shortly after, and the rest is history. I have no physical proof that the immunizations led to my autoimmune issues, but I got sick from them. I ran a fever within 24 hours after the booster. I felt horrible. I spent an entire day unable to leave my couch. She was preemie. She was tiny, and up to that point, I had spent all of my time trying to prevent her from getting sick, and then I allowed them to give her something that made her sick. It just didn’t feel right, and I believed that as long as they weren’t being exposed to people who had illnesses, then they wouldn’t need the vaccinations. When they got older or if we traveled or if the threat of getting something became more risky than the vaccination itself, then I would proceed to get them vaccinated. There is a fear of having your children get ill, and there is guilt if you get them vaccinated and they get sick. And there is fear and guilt if you don’t vaccinate them and they get sick. It’s a roll of the dice. There is danger in either choice, and it’s a matter of which is a bigger risk. Not only is there a fear that your child might get sick from the immunizations, but there is a belief that if the disease is so rare and everyone else is vaccinated then what is the chance of your child coming into contact with one of these illnesses? That mentality, pushed my decision to not get further vaccinations. Until last week, I have never hesitated at all in my decision. My children have been remarkably healthy. They haven’t even had any ear infections. My son has had issues with croup (viral) and strep throat (bacterial), but has never had any other ongoing medical issues. My daughter has had a cold twice in her life. She’s never had an ear infection, and I think she’s needed antibiotics once or twice in her life. So, when my son started to get sick in the middle of September, I thought great, “it’s going to be an early cold season.” Sure enough, a few days later, we all had the sniffles. We each in turn had a headache, sneezing, stuffy noses, but what made this a different type of cold, we all had body aches. Within a few days, we all started to recover from the cold, but my son instead of getting over it completely, developed a cough. It was no big deal at first. It was a dry cough. We kept him out of school for a few days and gave him OTC cold medicines. He seemed fine, but the cough was persistent. After a week of coughing, we took him to the doctor, who said, he had allergies that has progressed into a bronchitis. She didn’t feel the need for antibiotics which was fine with us. Your immune system will fight off bacterial infections within a week or two on its own (in most cases). A few days later, my daughter started to get sick. It was at this time that I realized this wasn’t from allergies or bronchitis because that night she sat upright in bed, while asleep, and coughed. It was hard for her to breathe because the coughing was so intense. I wanted to avoid having her go through what my son was going through, and I thought it would be best to get her on an antibiotic, so the next day I took her to the doctor. She reassured me that it was allergies and the drainage was causing her to cough, and that she didn’t need antibiotics. She said, if she wasn’t better at the end of the week, we should call her back and get an antibiotic. That sounded great to us, so we went about our regular activities. That weekend, she wasn’t better, but she wasn’t running a fever. She wasn’t coughing up green or yellow phlegm, so we called to get the antibiotics and went to a major amusement park for the day. When she was there, the cough progressively got worse. She was coughing constantly, and I was becoming more concerned. This wasn’t right. She was really sick. I thought, this might be whooping cough, but she doesn’t have a fever and she isn’t making a “whooping” sound when she coughs. It is just this persistent dry cough that makes it hard for her to breathe. So, I started to do research. My stomach sank when I read that a person may not run a fever with whooping cough! And a person may not make the whooping sound with the cough. And a person does not produce green or yellow mucous but significant amounts of clear, stringy mucous. At that point, I was 90% sure that she had it. The next morning, I contacted her doctor through the emergency line, and explained my concerns. They felt it was not whooping cough, but if I was concerned, I should take her to the urgent care. Frankly, they made it seem like I was being paranoid and over reacting. Everyone thought I was over reacting, my friends, my family. Despite the criticism, I took her to the local Children’s urgent care department. They started her on the correct type of antibiotics to error on the side of caution, and did a nasopharyngeal swab to determine if she did have pertussis. The next day, we found out that she did have it. I felt vindicated and guilty at the same time. I should have gotten the vaccinations. It was my fault. Where did my kids get this from? My son is very social and athletic. He attends our local high school, and he said that a friend from a nearby city had been sick. So, was there an outbreak in our state? That’s when I started to research this further, and what I cover in the next few blogs is what I found out. Frankly, folks, what I found out is STARTLING, and I believe we are on the verge of something significant regarding re-emerging diseases. Further, I really think it important for everyone to know the signs and symptoms because if you have a doctor like ours, you will find that either they don’t know enough about the infection or they don’t find it very concerning..or both.